So much form and function in a beautifully compact piece of furniture. This richly styled chairside end table puts it all within reach, including a flip-up top panel revealing a power port—perfect for keeping your phone or laptop charged. A pull-out drink and remote caddy tray are perfect for keeping the top organized. Lower cabinet is roomy for keeping essentials hidden. Its interior shelf is adjustable, giving you more flexibility for storing odds and ends. Plus, keep magazines out of sight with the magazine file located on the back of the table. 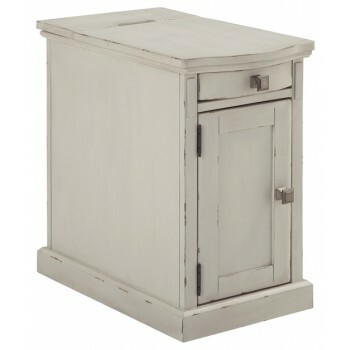 With an attractive white finish, this piece easily complements other furnishings.